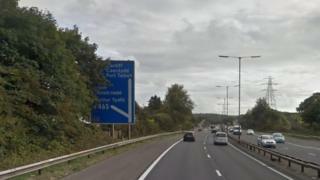 A drink driver who had to be rammed off the M4 motorway after a 20 mile high-speed police chase, has been jailed. Kristian Wilsher, 43, from Cardiff, reached 110 mph on flat tyres before police forced his Audi into a central reservation near Port Talbot. He admitted to dangerous driving, drink driving and failing to stop for a police officer, and was jailed for 12 months at Swansea Crown Court. The judge said it was “pure luck” no-one was killed or injured. The court heard Wilsher was spotted weaving on the road near St Clears, Carmarthenshire, and when officers tried to stop him he ignored the blue lights and raced away. During the pursuit he rammed a police car near Junction 43 (Llandarcy) and continued speeding after all four of his tyres were punctured by a stinger device. The court heard the only way he could be stopped was for police to ram his car. Wilsher, who was found to be two and a half times over the legal alcohol limit, caused 30,000 worth of damage to police cars during the chase. Judge Geraint Walters said Wilsher had driven at a ridiculous speed even for a sober driver and that it was an indication of the danger he had been to himself and others led led police to taking such action. Wilsher was banned from driving for two years after his prison release.